We were delighted to discover that ViewRanger achieved #1 Top-Grossing Apple iPhone app status in Norway this weekend - across all app and games categories. Used and trusted by outdoor enthusiasts, the ViewRanger app delivers clever outdoor GPS navigation, location-tracking, and high quality topographic mapping including charts from Norway's national mapping agency. 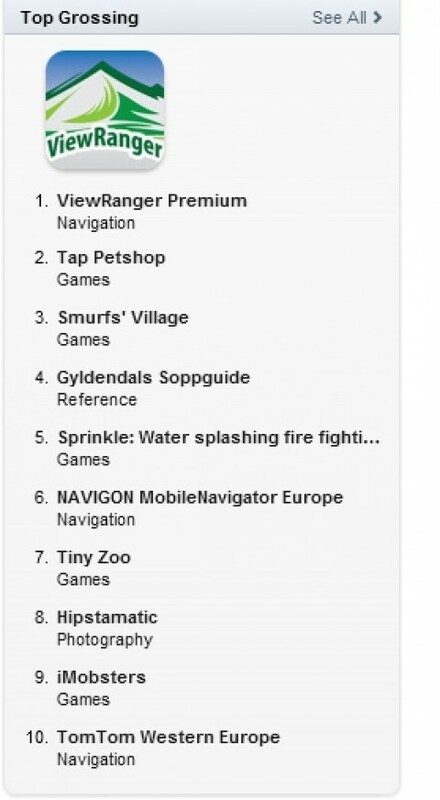 We proud that our ViewRanger app has a track record of achieving #1 status within the Apple iTunes Navigation category having become a best-selling app in many territories including Great Britain, Ireland, Slovenia, and just last week in Sweden. However, being the best grossing application for iPhone across all categories (including beating the new Smurfs game into third place) is fantastic. So a big thank you to all our Scandinavian customers!